Things usually found under a busy freeway: trash, gutters, unfortunate souls and the occasional furry creature. Things found under a busy freeway in Baltimore: organic vegetables, children hula hooping, arts and crafts, and some of the best food carts in the city. The Baltimore Farmer’s Market has its share of degenerates but the sights, smells and smiling faces make up for it. It is a haven of good grub if you are able and willing to get up early enough to get the good stuff. On Sunday we went a little late (around 11:00 am) so my favorite bacon man was sold out of slabs. Perhaps this is a good thing since I ate more than my fair share of bacon last week and should feast on salad until further notice. Conveniently, the farmer’s market was packed to the rafters with baby sweet potatoes, okra, peppers of all varietals, broccoli, leafy greens and other seasonal treats. These are all inspirational goodies for this week’s personal food journey. If you ever find your way to this foodie oasis hidden in Baltimore's belly, please do not go home without a falafel sandwich from B-more Alive! 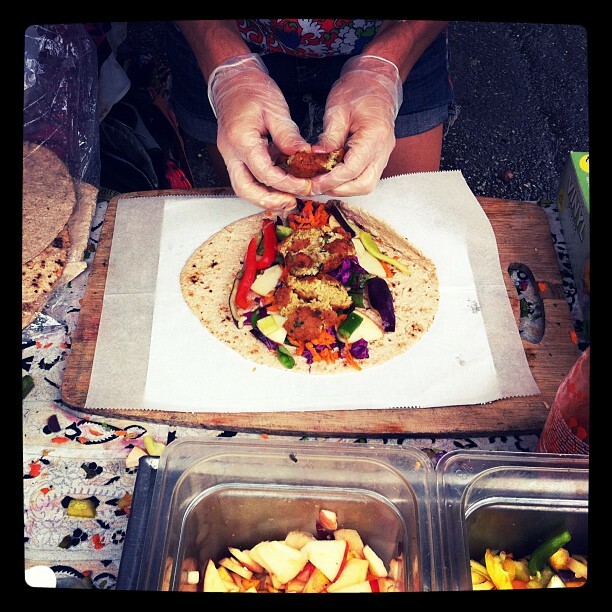 This rainbow in a wrap is made with all local and seasonal ingredients. The toppings change and can get pretty creative, but the falafel is always hot and flawlessly cooked with a soft center and a crunchy exterior. 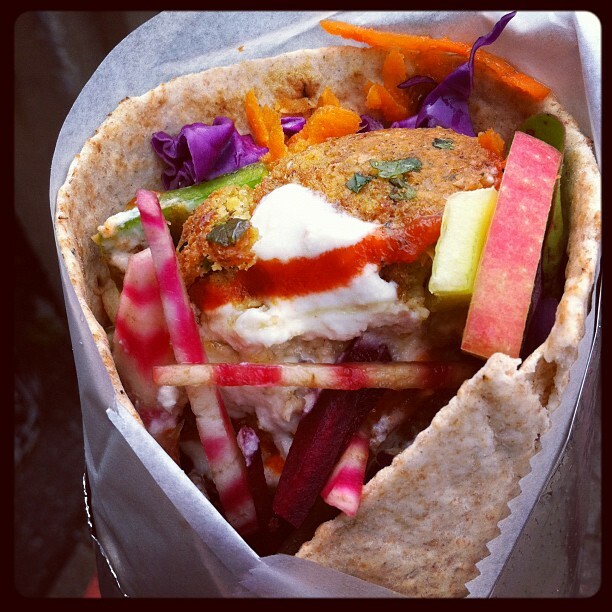 My wrap was stuffed with apples, carrots, peppers, tahini dressing, sriracha, carrots and at least five other vegetables. The most creative vendor award goes to Wheely Good Smoothies. The owner, Natan Lawson, created blenders that are powered by bicycles. You have the opportunity to blend your own smoothie (Natan will do it for you if you are hung over or wearing a dress) by simply pedaling the bike for a few seconds. This just reiterates that MICA kids are totally cool. Be sure to stop by the Baltimore Farmer’s Market when you are in the city, and bring a big bag to carry your loot, a wad of cash and a huge appetite. Unfortunately, it's not year round so check the website for dates. 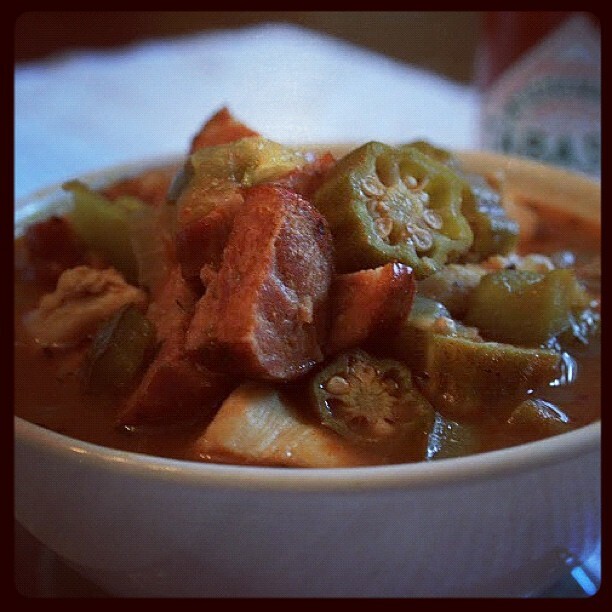 With the wonderfully fresh okra, I made a hearty chicken gumbo last night. Although noteworthy, it isn’t quite perfected yet. It is my new mission in life to make a flawless gumbo. Wish me luck. 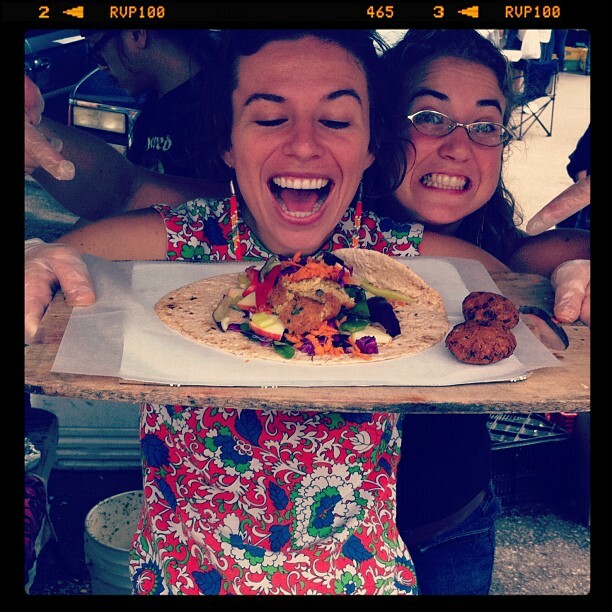 Great pictures, I'm a huge farmer's market fan. Love finding new ones to visit. You will roux the day you took on this quest! The secret is using oil instead of butter as you are going for a dark brown color, but pushing it too fast and high only results in burnt flavor ...then it is rouxn't. 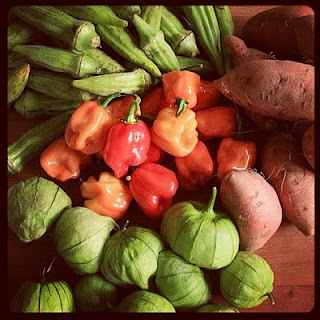 Lotsa folks don't like okra and leave it out. Mistake #2, as the darkened flour doesn't thicken as you would expect and okra picks up that slack. So ...here's wishin' you "Luck"!